The poor chickpea. It gets such little respect. No one can even agree on what its name is. Is it a garbanzo bean? Is it a chickpea? No one really knows. But before you give up on these little legumes, you should know they are versatile and yummy and full of goodness. 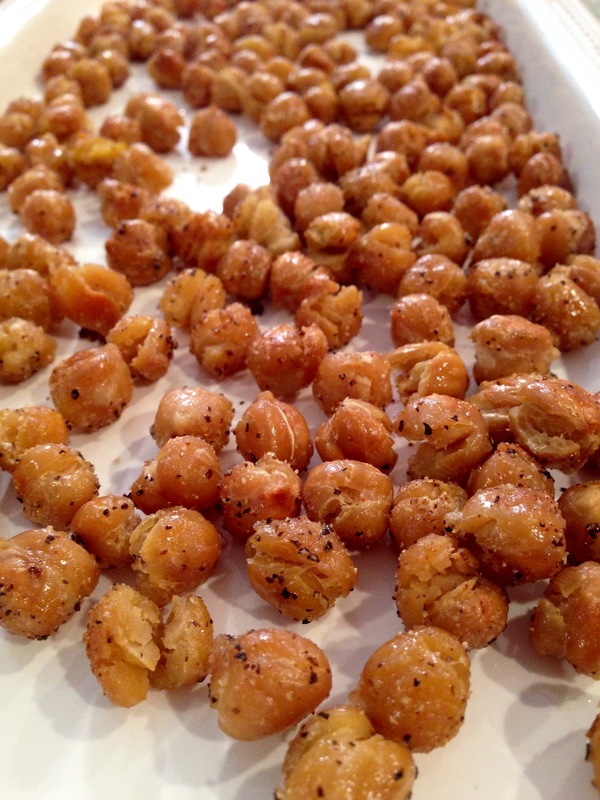 For instance, 1/2 cup of chickpeas have both 6 grams of protein and 6 grams of fiber. The average adult needs about 24-35 grams of fiber a day depending on how many calories a day you consume. And while the amount of protein you need is widely debated, it is a good idea to consume a good-quality protein at least 3-4 times a day to keep your blood sugar in check. I was recently told that my afternoon carb cravings were a result of too little protein in my diet. I am not sure if that is scientifically sound advice or not, but I have noticed that when I add a protein rich afternoon snack, I don’t feel the need to hoover a bag of Goldfish crackers. Rinse and drain the chickpeas well in a colander. Spread out onto a baking sheet, and blot dry with a clean towel or paper towels. Drizzle about 1-2 T of olive oil over the chickpeas and shake the pan to coat. Sprinkle salt, pepper and whatever spices you want on the chickpeas. If you are using cinnamon you might want to skip the salt and pepper. Bake at 350 degrees for about 20 minutes, and then shake the pan or use a spatula to move the chickpeas around so they evenly bake. Bake for another 10 minutes or so, until golden brown. The outside should be crispy and the inside should be tender. Good luck keeping them around for more than a few minutes! Whoa! I totally want to try this. This and the banana nut muffins.